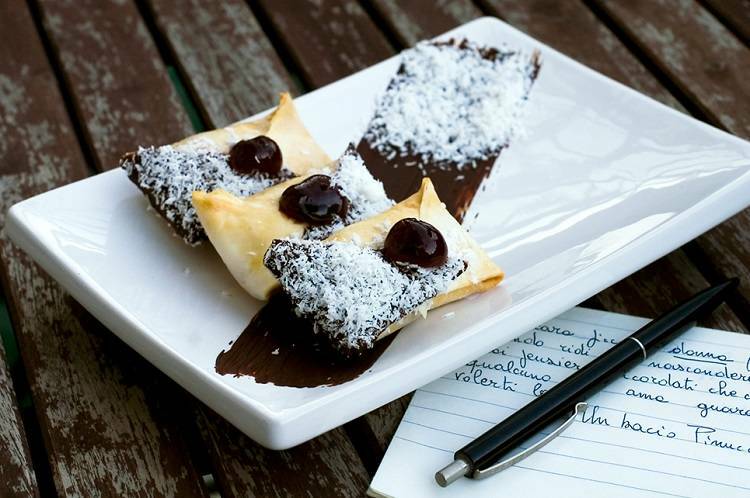 This Valentine's Day, treat your loved one to romance: "love letter" pastries. There is nothing like a homemade gift — especially when it tastes like this! The recipe for Lettere d'Amore comes from our friends at Fabbri, the historic Italian company celebrated for its Amarena cherries in syrup. Sweet yet tart, Fabbri's cherries are delicious when slathered over a hefty scoop of creamy gelato, blended with yogurt for a breakfast treat, or even used as a classic cocktail garnish. The bright flavors especially comes through in these decadent pastries! Combine the ricotta with the egg yolks, the sugar, and the coconut. Drain the cherries, and cut them into fairly big pieces before stirring them into the ricotta mixture. Using a teaspoon, fill half of the sheets of filo pastry with the mixture, and then make a triangle by joining the edges together, folding the corners of the 3 sides inwards, to form a parcel. Brush each parcel with egg white, and then cover each parcel with another sheet of filo pastry, following the same procedure. Bake the pastries at 350°F until the parcels are golden brown. Melt the dark chocolate in a bain-marie, and cover half of each parcel with the melted chocolate. Dust the surface with powdered coconut, and place half an Amarena in the center, so that it looks like sealing wax closing an envelope. Leave to cool on a cooling rack. For best results, enjoy these parcels with a loved one.